1. Sharing a common goal: As each goose flaps its wings it creates “uplift”, an aerodynamics orientation that reduces air friction, for the birds that follow. By flying in a V-formation, the whole flock achieves a 70% greater flying range than if each bird flew alone. The lesson we can learn here is that people who share a common direction and goal can get where they are going quicker and with less effort because they benefit from the momentum of the group moving around them. Make sure your team and company is aligned towards a common goal. 2. Increasing visibility: Flying in a V-formation increases the visibility as every goose can see what’s happening in front of them. The lesson here is to make our organizations visible in both org-chart directions. Having top-down visibility enables leaders to stay connected with the edges of the organization to make better informed decisions. Bottom-up visibility enables employees to see the bigger picture, engages them, and empowers them to better align themselves with the organizational objectives. 3. Having humility to seek help: When a goose falls out of formation, it suddenly feels the friction of flying alone. It then quickly adjusts its mistake and moves back into formation to take advantage of the lifting power of the bird immediately in front of it. The lesson we can learn here is to be humble to admit the challenges we face and to seek help as soon as we get stuck. This humility will enable you, your team, and your company to move faster and achieve more. 4. Empowering others to lead: When the lead goose in the front gets tired, it rotates back into the formation and allows another goose to take the leadership position. The lesson here is to empower others to also lead. Micro-managing and keeping tight control will burn you out. It will also disengage and demotivate others around you. People have unique skills, capabilities, and gifts to offer. Give them autonomy, trust and a chance to shine, and you will be surprised with the outcomes. 5. Always recognizing great work: The geese honk to recognize each other and encourage those up front to keep up their speed. The lesson here to make sure we praise people and give them the recognition they deserve. Lack of recognition is one of the main reasons employees are unsatisfied at work and quit. It’s very common for people’s efforts to go unnoticed by their peers in a busy and fast-moving work environment. However, remembering to constantly provide recognition and encouragement is vital and keeps teams motivated to achieve their goals. 6. 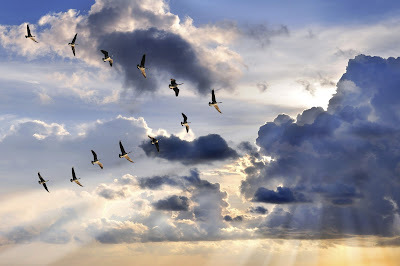 Offering support in challenging times: When a goose gets sick or wounded, two geese drop out of formation and follow it down to help and protect it. They stay with it until it dies or is able to fly again. Then, they launch out with another formation or catch up with the flock. The lesson here is to stand by each other in difficult times. It’s easy to always be part of winning teams, but when things get difficult and people are facing challenges, that’s when your teammates need you the most. 7. Staying committed to core values and purpose: The geese migration routes never vary. They use the same route year after year. Even when the flock members change, the young learn the route from their parents. In the spring they will go back to the spot where they were born. The lesson to learn here is to stay true to our core values and purpose. Strategies, tactics, and products may change in order for an organization to remain agile, but great companies always stick to their core purpose and values, and preserve them with vigor.